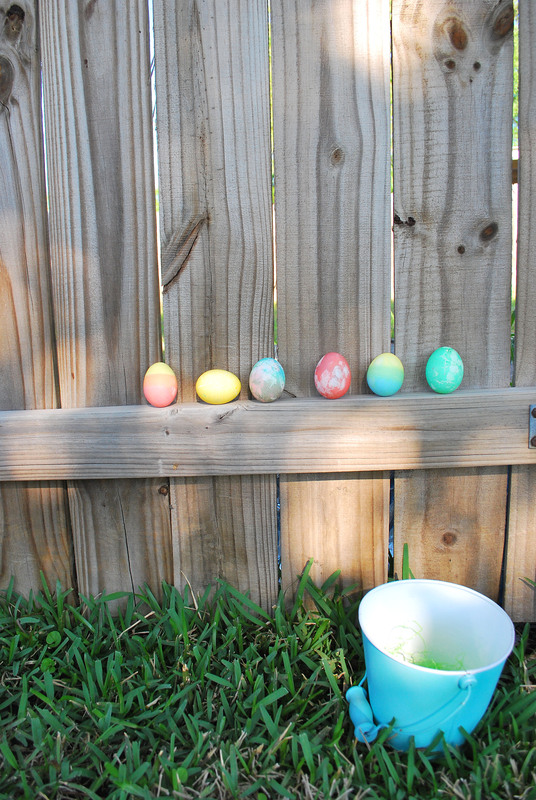 It’s somewhat of a tradition to dye eggs for Easter. We always did it when I was growing up, and this year, I decided it was finally time to share the fun with Son. 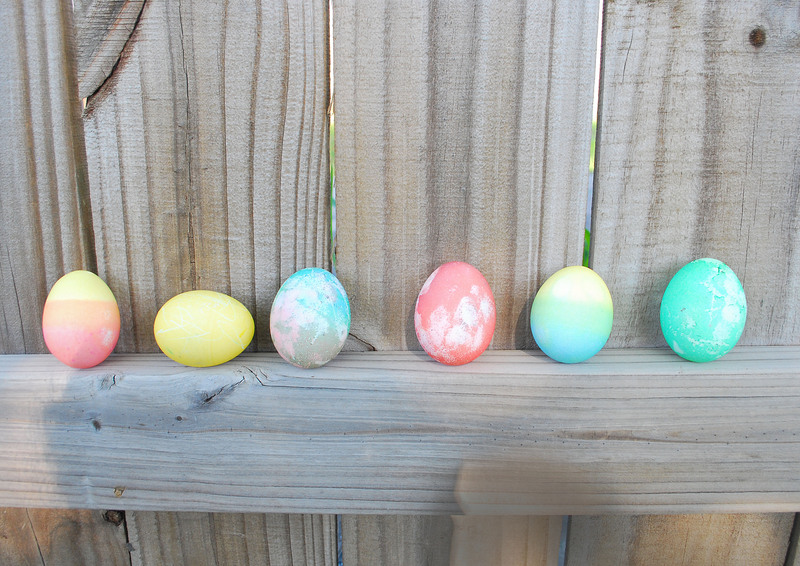 Since I’m a DIYer, I decided I’d come up with my own way of dyeing eggs, that, and I forgot to purchase a kit. Obviously, the first thing you need to do is boil your eggs. I don’t know how it happened, but I am a master egg-boiler. Seriously. I never have any grey on my yolks, and Son loves to eat the hard-boiled eggs plain. So I must be awesome. 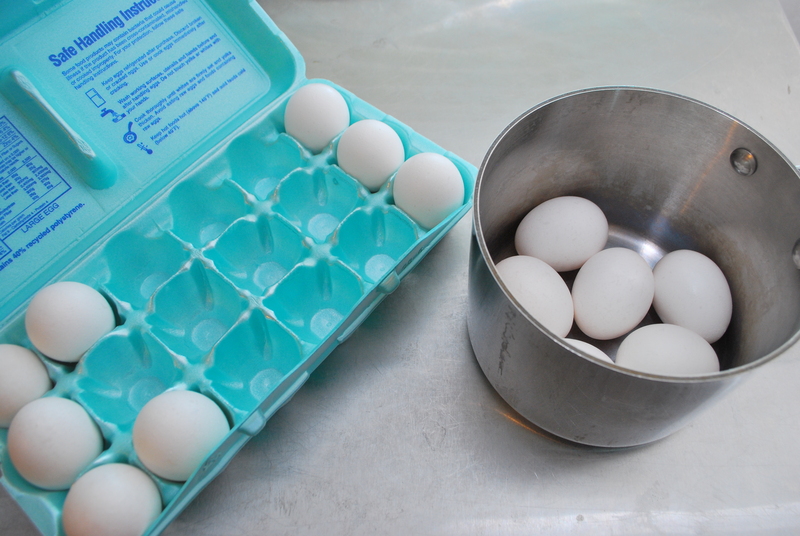 To get perfectly hard-boiled eggs, you need eggs, and a pot with a lid. Begin by placing your eggs into your pot; I chose to do six this time. Then fill the pot with enough water to just cover the eggs. The more water, the longer it will take to boil. 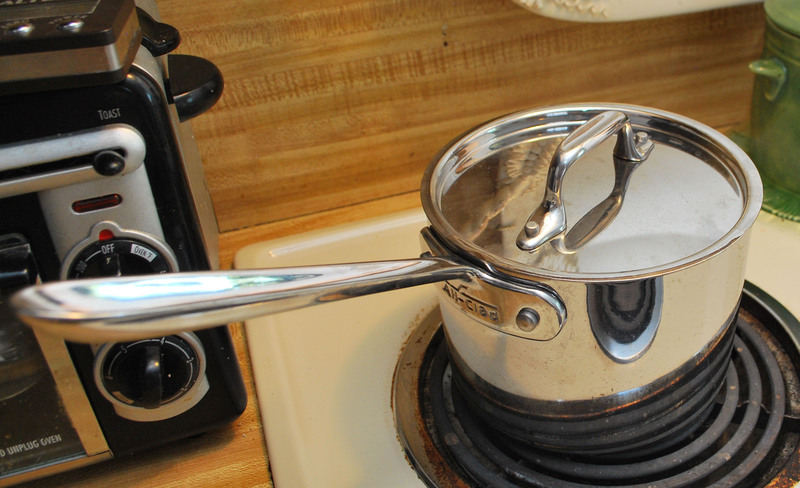 Place the pot onto the stove, uncovered, and turn the heat on high. 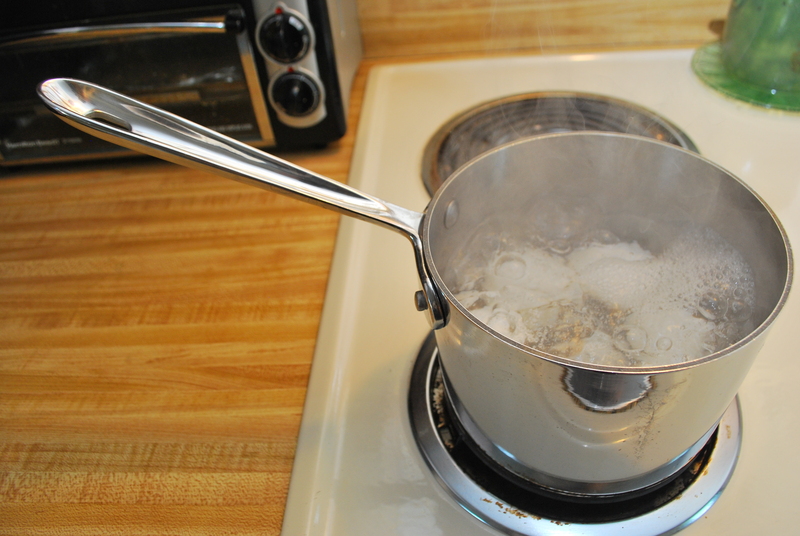 Bring water to a boil, and allow it to stay there for ONE minute. After one minute has passed, remove pot from heat, and cover. Allow to stand for 10 – 12 minutes. I like my eggs with a darker yellow center, so I only let mine sit for 10 minutes. If you want them lighter yellow, but still without the grey, go for longer, but no more than 12 minutes. 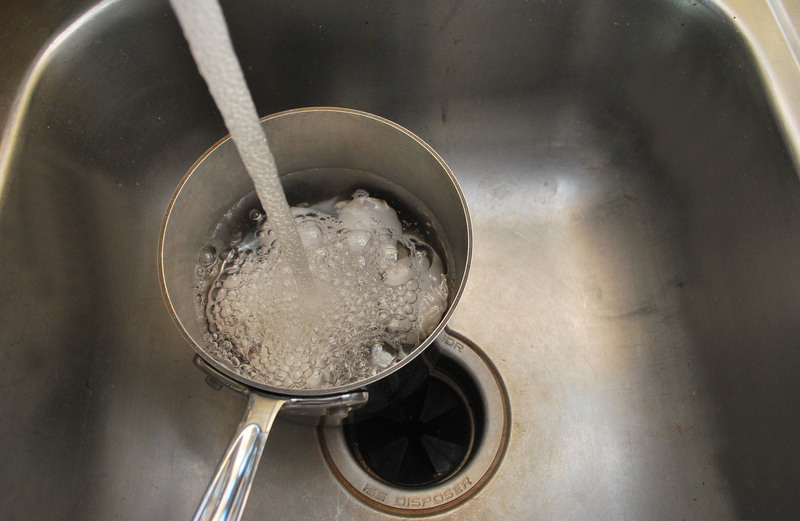 Then simply drain off the water, and run cool water over your eggs. This is where I would normally peel them, but since I wanted to dye these for Easter, I didn’t do any peeling. 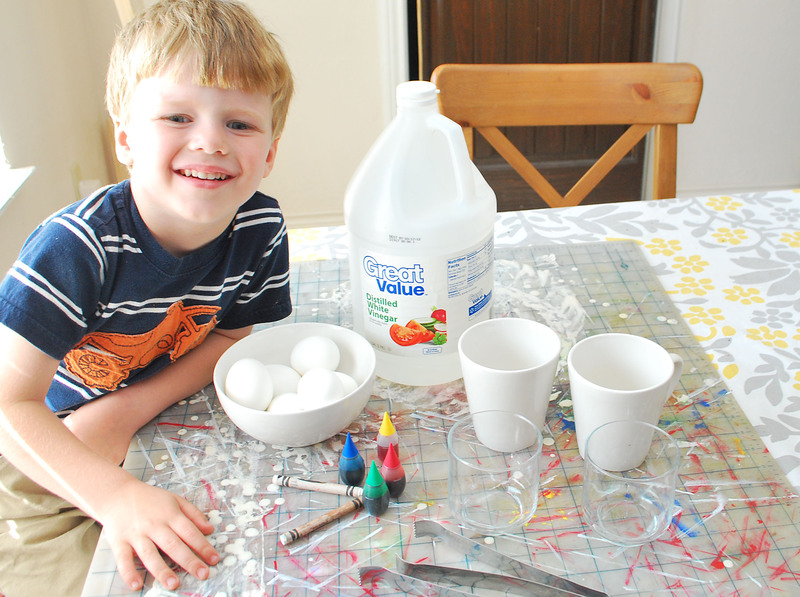 Fill your vessels with vinegar so that the eggs will be covered when submerged. Then, drop food coloring into each until you have it as dark as you’d like. Of course, that is assuming you used Red, Yellow, Blue, and Green. To dye your eggs, just dip them into the vinegar. 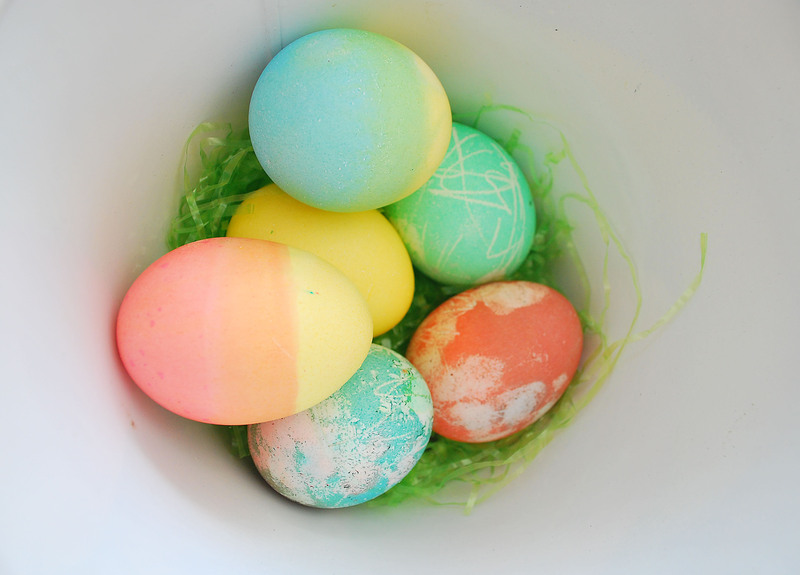 You can use the crayon to draw designs on your eggs, and the area will remain white when the egg is dyed. 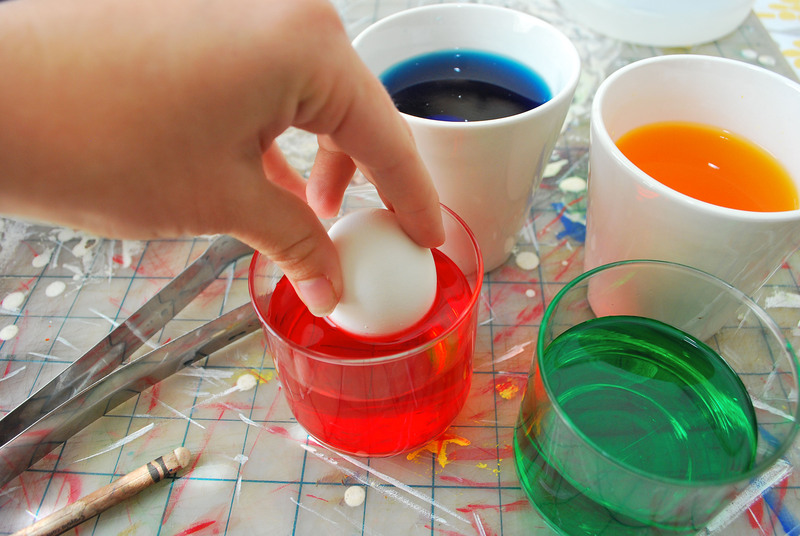 The longer you let an egg sit in the dye, the brighter the color will be. Allow the eggs to dry before hunting them. Can you tell which ones I did? 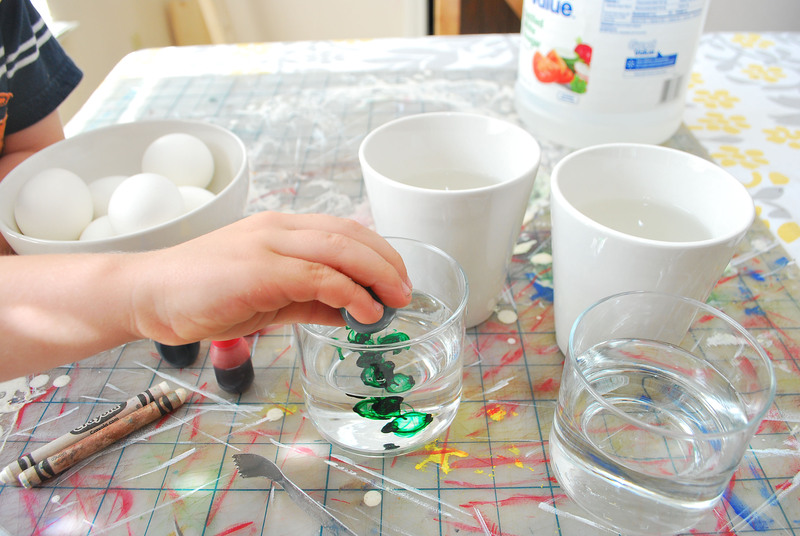 So just in case you forgot that Easter is in TWO DAYS, and you have yet to buy your egg dyeing kit, or if you’re just too cheap to buy a kit, you now have the power to make your own. And of course, you will also have perfectly boiled eggs for your future salads. Yum. This is excellent. I told Angus we could just use food color and he was skeptical – now I’ll show him this post. Males are always skeptical. Good thing you now have proof! This is a really nice idea! 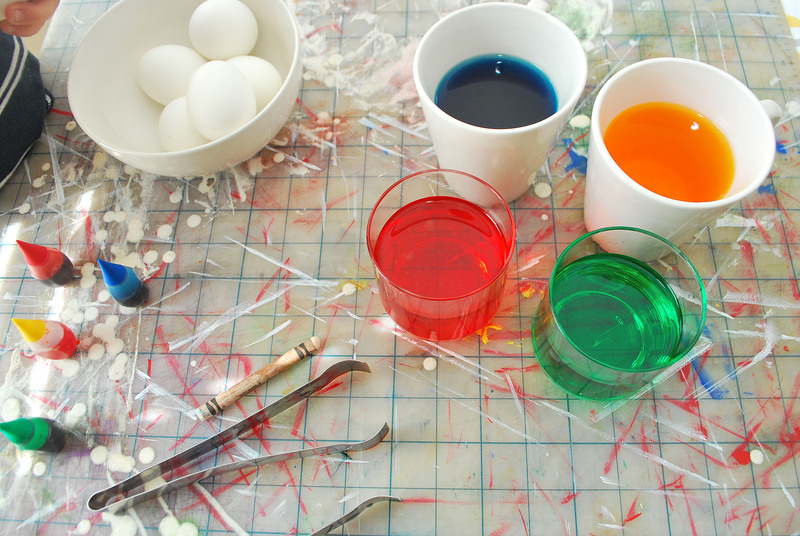 I didn’t know you could paint eggs with food color!! Sme great tips and gorgeous pics too – love it! Thank you for sharing this. Has been a while since I’ve dyed eggs. We had some issue with the dye and the vinegar not sticking to the eggs so we had to modify it some. We used about a half cup boiling water with a tsp of vinegar. That seem to do the trick for us. The eggs turned out great inside. (Rylee cracked one and tried it). Y’all have a hoppy Easter! !